Last week's challenge: The object of this two-week challenge, presented on June 3 and 10, was to pitch a program proposal to one of the TV networks, either broadcast or cable, in which the show's title differs by just one letter from an existing show's title, past or present. I asked for a summary of the show in 15 words or less. Entries were judged on their sense, at least remote plausibility, humor, and overall effect. We got 1,332 entries, averaging two to three program pitches each, or several thousand pitches altogether. I read them all. • Who Waits to Be a Millionaire? Next week's challenge: This week's challenge comes from Mike Reiss, a writer for The Simpsons, who's a frequent contributor here. Think of a familiar hyphenated 7-letter word. The first 4 letters name a prominent American company, and the last 4 letters name a different prominent American company. What word is it? If you know the answer to next week's challenge, submit it here. Listeners who submit correct answers win a chance to play the on-air puzzle. Important: Include a phone number where we can reach you Thursday, June 21 at 3 p.m. ET. It's Father's Day. And if you've waited until the last minute to get your gift for dear old dad, pull him over to the speaker right now because I've got one he'll love. It's The Puzzle. GARCIA-NAVARRO: So a couple of weeks ago, you gave us all a creative challenge to work on. Remind us of what it was. SHORTZ: Yeah. The object was to pitch a program proposal to one of the TV networks, either broadcast or cable, in which the show's title differs by just one letter from an existing show's title, past or present. I asked for a summary of the show in 15 words or less. GARCIA-NAVARRO: We had 1,332 responses. This was a very popular one. And I'm very excited to hear some of the runners-up before we get to our winner. SHORTZ: That's great. Beverly Sills 90210. I collected lots more of these for the NPR website, which you can check out. GARCIA-NAVARRO: Those sound amazing. Let's go now to our winner, Gail White from Canal Winchester, Ohio. Welcome to the program and congratulations. GAIL WHITE: Thank you very much. GARCIA-NAVARRO: So tell us your creative TV show pitch. WHITE: I remember watching a show on TV when I was a child - "I Remember Mama" about a Norwegian-American family in San Francisco in 1910. So I came up with "I Remember MOMA," M-O-M-A, with the concept being that each episode would focus on either an exhibit or an artist on display at the Museum of Modern Art. GARCIA-NAVARRO: Will, what drew you about that? SHORTZ: First of all, it was an absolute unique entry. No one else duplicated it. And I loved the letter substitution, which was surprising. And it was a show I could actually imagine appearing on TV. GARCIA-NAVARRO: There you go. All right, Gail. I hear that you used to work for the Air Force. Tell us more. WHITE: I was an Air Force nurse during the Vietnam War era, which is where I met my husband, who was an Air Force pilot. And I served for five years. He served for 26. GARCIA-NAVARRO: Wow. Well, thank you so much for your service and that of your husband. Are you ready to play The Puzzle? WHITE: I am as ready as I can be. GARCIA-NAVARRO: (Laughter) All right. Here we go. Take it away, Will. SHORTZ: Every answer today is the name of a world capital. I'm going to give you two words. Change the last letter of each word to a new letter, so the result, reading left to right, names the capital. For example, if I said card, C-A-R-D, and cap, C-A-P, you would say Caracas, which changes the D of card and the P of cap. WHITE: So change the last letter in each word? SHORTZ: Number one - bet, B-E-T, and jinx, J-I-N-X. SHORTZ: Beijing. Good. Buds. Peso. SHORTZ: S. And Peso, P-E-S-O. WHITE: Narrow? No. Nab. Robe. Nairobi? SHORTZ: That's it. Pro, P-R-O. Toric, T-O-R-I-C.
WHITE: All I think of is Praha. SHORTZ: OK. Think South Africa. SHORTZ: Pretoria is it. Kink. Hasp, H-A-S-P.
SHORTZ: Kinshasa is it. Good. SHORTZ: That's it. Trim, T-R-I-M. Old. SHORTZ: Tripoli is it. How about damp, D-A-M-P? Scum. SHORTZ: Accent the second syllable. SHORTZ: Damascus, Syria, is right. SHORTZ: And here's your last one. Khan, K-H-A-N. Tour, T-O-U-R.
SHORTZ: Khartoum, Sudan, is correct. GARCIA-NAVARRO: Bringing it in strong at the end. For playing our puzzle today, you get a WEEKEND EDITION lapel pin, as well as puzzle books and games. You can read all about it at npr.org/puzzle. Gail, what member station do you listen to? GARCIA-NAVARRO: Gail White from Canal Winchester, Ohio, thank you for playing the Puzzle. WHITE: Thank you so much for letting me play along with Will. GARCIA-NAVARRO: (Laughter) All right, Will. What's next week's challenge? SHORTZ: Yes. It comes from Mike Reiss, who's a writer for "The Simpsons." And he's a frequent contributor here. Think of a familiar hyphenated seven-letter word. The first four letters name a prominent American company. And the last four letters name a different prominent American company. What word is it? So again, a familiar hyphenated seven-letter word whose first four letters and last four letters each name a well-known American company, so these names will overlap on the middle letter. What word is it? GARCIA-NAVARRO: When you have the answer, go to our website npr.org/puzzle and click on the Submit Your Answer link. Remember - just one entry per person, please. Our deadline for entries is this Thursday, June 21, 2018 at 3 p.m. Eastern. Include a phone number where we can reach you at about that time. And if you're the winner, we'll give you a call. 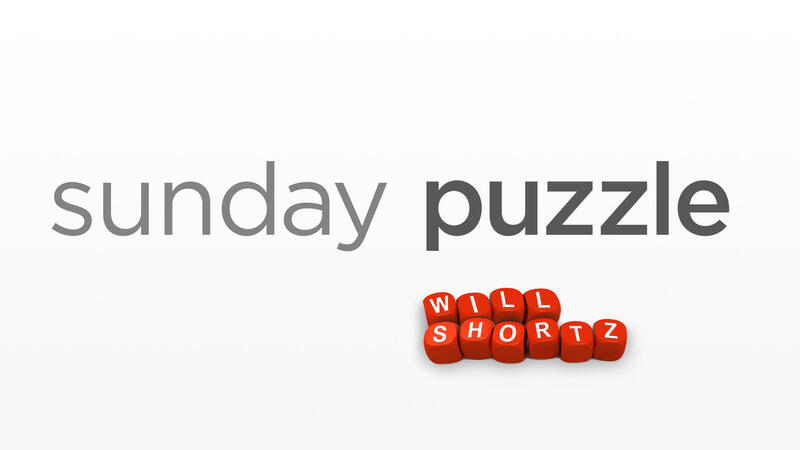 And you'll get to play on the air with the puzzle editor of The New York Times and WEEKEND EDITION's very own puzzlemaster, Will Shortz. Thanks so much, Will.